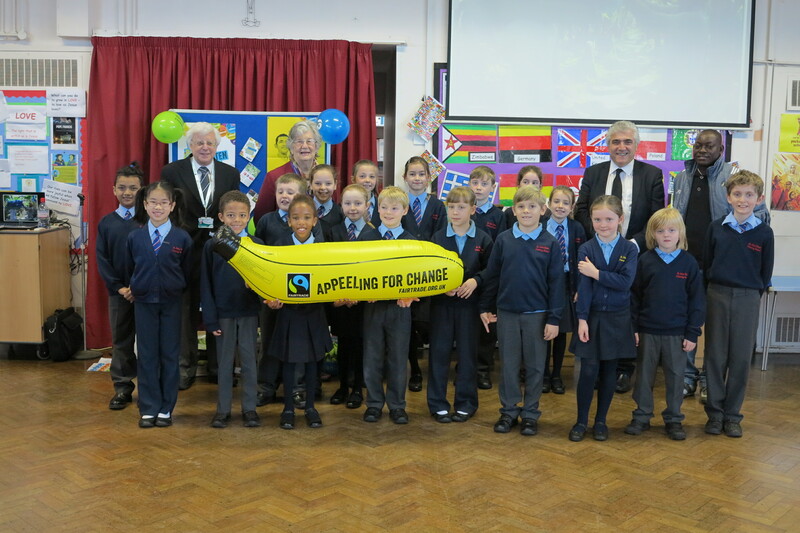 A Columbian banana farmer gave a presentation to Merton school children marking the start of Fairtrade fortnight, 24 February – 9 March 2014. Banana farmer Alexis Martinez, special guest of Fairtrade London during the fortnight, visited St John Fisher primary school and spoke to young people at their morning assembly. He spoke about the banana trade and how trading fairly makes a difference to living standards. This was followed by a question and answer session with children and teachers. Fairtrade bananas were handed out to children after the assembly donated by Sainsburys- Morden, Tesco- New Malden and Co-Op- Grand Drive. Leader of Merton Council, Councillor Stephen Alambritis, Councillor Margeret Brierly and Councillor Maurice Groves attended the event.